Forged Rolled Rings | What Are the Different Types of Forgings? Forged rolled rings are crucial to the manufacturing and design of many different products. There can be several different ways to get a rolled ring forging depending on the type of forging process that is used. Let’s take a look at the different types of forgings out there. Open die forging takes place when flat dies that have no precut profiles engage in forging. The open design allows the metal to flow everywhere except where it touches the die. Open die forging is useful when it comes to short-run art smithing or for shaping ingots. Sometimes referred to as impression die forging, closed die forging employs the use of molds. These molds are attached to an anvil while a hammer forces molten metal to flow into the cavities of the die. While the process can be expensive for short-run operations, it becomes cost-effective as the number of parts produced increases. When it comes to press forging, the main forming factor is compression. Applications of press forging are numerous, as there are relatively no limits to the size of the product that can be created. It can also be done hot or cold. Are You Looking for Forged Rolled Rings? 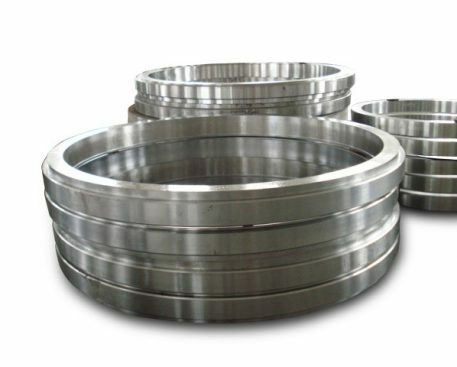 At Ferralloy, we provide high-quality rolled ring forgings at competitive prices. No matter what the project you are working on, we have the rolled ring forgings that you need. Contact us today to learn more about our rolled ring forgings or to place an order.